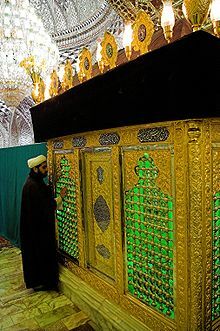 A mullah praying in Imamzadeh Seyyed Hamza, Tabriz. In may Islamic countries Mullah Persian: ملا‎ or Mula is the name given to a man with an education in Islamic theology and law. The title Mullah is commonly used for petty local Islamic clerics or mosque leaders. It is primarily understood in the Muslim world as a term of respect for a religiously educated man. ↑ Roy, Olivier (1994). The Failure of Political Islam. Cambridge, Massachusetts: Harvard University Press. pp. 28–9. ISBN 0674291409. This page was last changed on 19 June 2013, at 08:12.